HomeRecipesRecipesFishIs It A Shrimp? Or, Is It A Prawn? Is It A Shrimp? Or, Is It A Prawn? Actually, it can be whatever you want it to be. Neither are scientific terms. They’re regional terms. Here in the United States we call pretty much all of them shrimp. Maybe if we have an exceptionally large one, we’ll call it a prawn. But, we do have a particularly beautiful and tasty crustacean from a particularly beautiful part of our country…Hawaii. It’s the Hawaiian Blue Prawn. Its features are a little different from the shrimp we are custom to. Its body is longer and narrower. 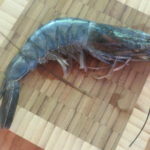 It has a brilliant blue color and its taste is unlike any shrimp you have ever tasted. 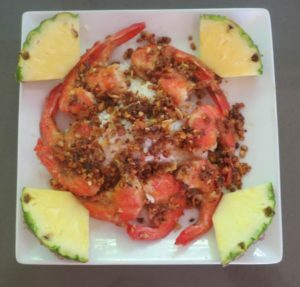 It’s sweet and succulent, similar in flavor to lobster. They say it’s the sweetest prawn on the market (that means the sweetest shrimp too). What else is unique to this very pretty prawn? It’s born in fresh river waters. The eggs wash out to sea. The tiny little prawns live out to sea, molting 20-30 times. Before its last molting it finds its way to a fresh water stream were it will live out its adult life. 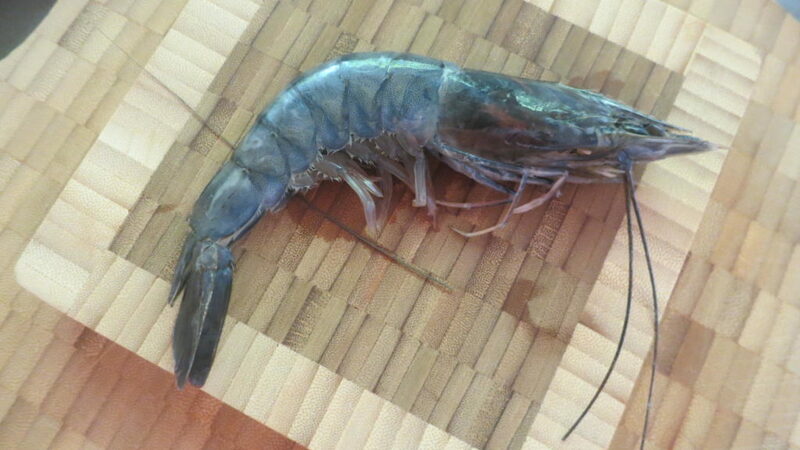 The wild caught Hawaiian Blue Prawns are sashimi grade so they can be eaten raw. 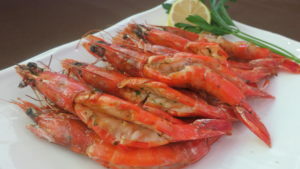 The size is under 12 prawns per pound (U-12). They’re great on the grill or sautéed. I did a recipe for both cooking methods. The grill method is similar to what I do with lobster on the grill. The shell helps protect the prawns from the dry heat of the grill. I cut the shell down the back of the tail (you can cut the head off or leave it on). I like to leave the head on, it’s kind of showy. Using a paring knife I cut the shrimp in half but I leave the shell on the bottom intact. Clean the mud vein out with your paring knife. 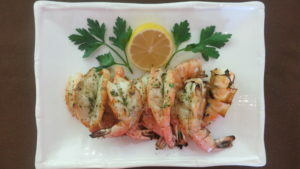 We’ll make a parsley lemon butter to baste the prawns while they’re grilling. Be ready to enjoy with lots of paper towels or napkins. Its easiest to just use your hands (forget the poshy silverware). Just dig in! For the other recipe, I was inspired by the food trucks in Hawaii. I figured who would know better what taste the best with this delectable morsel. It’s all about the exceptional flavor of the prawn so I kept it simple as well.